Ca01 St-Valéry-sur-Somme, StP.Gruppe Cayeux, K.V.A. 'E1'. Picardy. 2 x 5cm KwK 38. 1 x Pz.T.FT17 tank turret. 4 x 8.8cm Flak M31 (r). Vf600 for a 5cm KwK gun. St-Valéry-sur-Somme sunrise at the church. 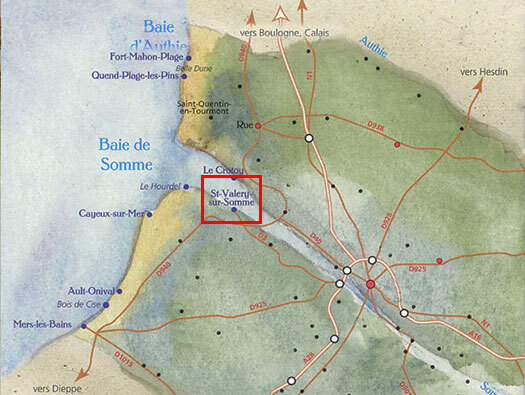 I have to admit we did not go and look for the defences at Ca01 as we were very busy with other things but I have added some pages about St-Valéry-sur-Somme. To get to the remaining defences walk to the river and go along the south bank, Quay Jeanne d'Arc towards the sea. The the defences are along the Quay. R501 group bunker possibly under construction. 5cm KwK 38 L42 gun. St-Valéry-sur-Somme sunrise on the Somme. R502 twin group bunker also may have been under construction. Jeanne D'arc was captured at Compiégne by the English-allied Burgundian faction, was later handed over to the English and then put on trial by the pro-English Bishop of Beauvais on a variety of charges and was convicted on 30 May 1431 and burned at the stake when she was about 19 years old. Somme estuary and the end of a very good day. A prominent house on the north bank. 8cmPLKvz37 (r), this may have been the type of AA guns used here.